In this review we feature the best AV receivers for home theater that provide superb sound quality and surround sound listening experience. These AV receivers are designed to support 5.1 or 7.1 home theater configurations and can be easily linked to your TV and speaker inputs with multiple input options. 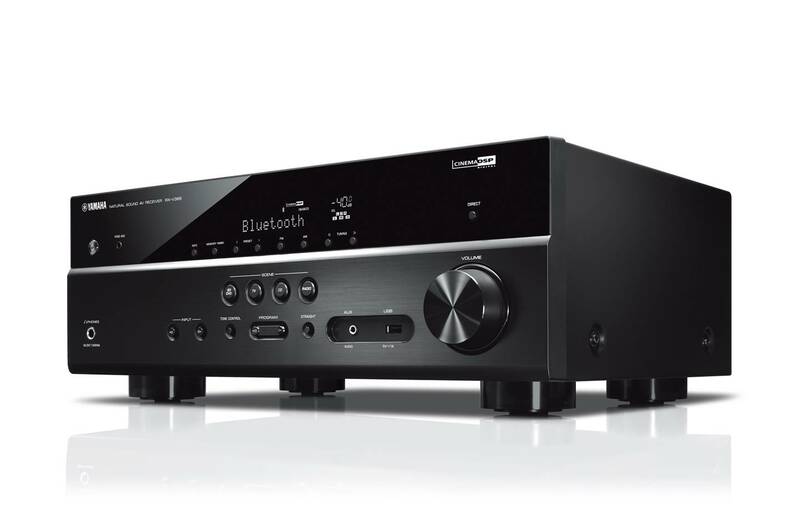 Furthermore, these AV receivers support 4K ultra HD pass-through, providing excellent sound quality and movie effects. Our experts have tested each AV receiver to determine how well they perform in a home theater setup, and selected these receivers based on their performance. If you are looking for the best AV receivers for home theater, be sure to check out our top picks below! 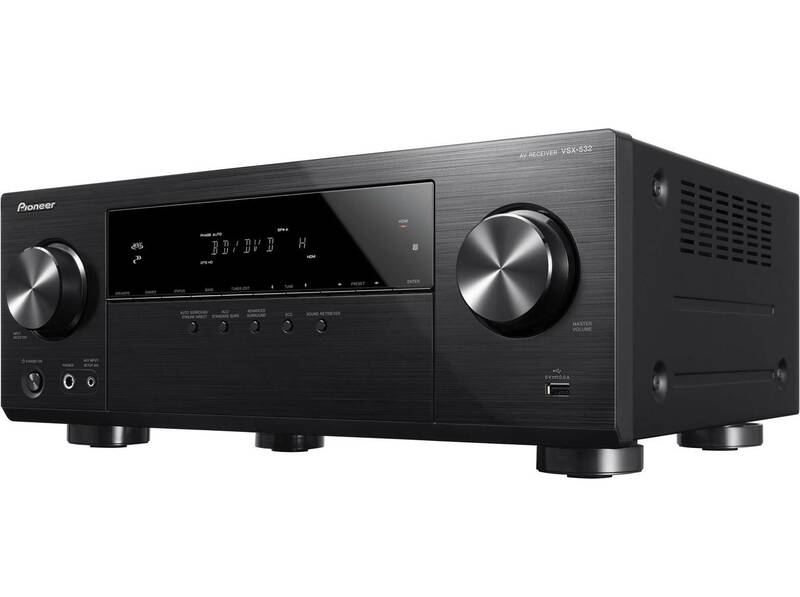 The Yamaha RX-V385 is a 5.1-Channel 4K ultra HD AV Receiver with Bluetooth connectivity. It delivers 5.1 channel premium quality sound with rich bass reproduction, thanks to its low-range enhancement technology. All speakers maintain good localization and sound balance, delivering a detailed soundscape. It also features YPAO auto-calibration technology for better sound performance. The RX-V385 offers the ability to bi-amp the front speakers (L, R), which drives the treble and bass ranges with independent amplifiers. In addition to providing greater power, this also prevents interference between the high and low frequencies. The RX-V385 offers virtual 5-channel surround sound with all of the speakers placed in the front of the room, in case you cannot install surround speakers behind the listening position. It is compatible with the latest HDMI standards and delivers transmission of 4K video at 60 frames/second pass-through. The RX-V385 AV receiver also supports HDR (high dynamic range) Video including Dolby Vision and Hybrid Log-Gamma which provides better contrast, smooth tone and rich, bright colors. To set it up, you can use a special app and get expert assistance with cable connections between the AV receiver and source devices. The app can also guide you through various other settings such as speaker connections, TV and source device connections and power amplifier assignments. 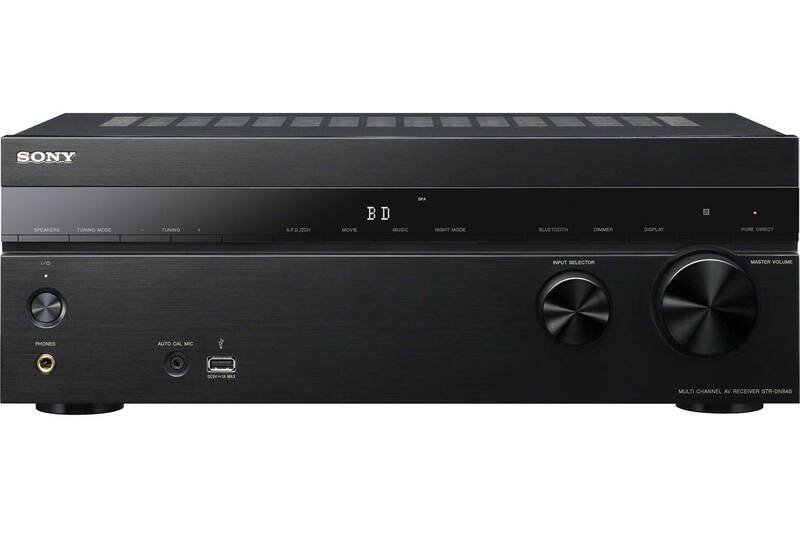 The Sony STRDH590 is a 5.2 multi-channel 4K HDR AV Receiver with Bluetooth connectivity. Its built-in Bluetooth technology lets you wirelessly stream from other Bluetooth devices. Its S-FORCE PRO front surround sound, Dolby TrueHD and dts HD enhanced audio codecs ensure an immersive and detailed sound experience with a wide sound stage. It delivers crisp and crystal clear sound performance. The Sony STRDH590 AV receiver is equipped with 4 HDMI inputs and one output as well as an audio return channel It is compatible with the latest 4K TVs, HDR picture and Dolby Vision, featuring HDCP 2.2 signal handling support. You can listen to the radio as it is equipped with an FM radio receiver and can save up to 30 station presets. It is compatible with a full-size (1/4”) headphone jack. Additionally, the Sony STRDH590 has 4 stereo RCA audio inputs and digital audio outputs (1 optical and 1 coaxial). The low-profile design of the Sony AV receiver (5 ¼” tall) fits easily into any conventional TV cabinet. The package includes a remote control (RMT-AA401U), batteries, an FM antenna as well as a calibration mic (mono). The Sony STRDH590 is very easy both to set up and calibrate, for premium sound quality as well as high performance video capability. The Sony STRDH770 is a 7.2 Channel Home Theater 4K AV Receiver that delivers premium quality surround sound with 145 watts per channel. Its NFC and Bluetooth connectivity allows for easy wireless streaming from compatible music devices, smartphone, tablet, or computer and digital music players. In addition to that, it incorporates convenient USB connectivity that supports MP3, AAC, WMA, WAV 192k, FLAC 192k, ALAC and AIFF formats. The Sony STRDH770 AV receiver delivers lossless quality surround sound with DTS-HD (decoding through HDMI) as well as Dolby TrueHD audio. It is possible to easily set up the speakers using its automatic calibration functionality. You can optimize your receiver settings to mimic movie theater sound characteristics with HD-Digital Cinema Sound. The Front Height mode enables vocal height and 3D effects for improved effects positioning and added depth. It comes with four HDMI Inputs and one output. All the inputs and outputs on this AV receiver are HDCP2.2 compatible and support 4K 60p 4:4:4 / HDR for true 4K quality. The front surround sound technology allows you to enjoy surround sound effects using only the two front speakers. The Sony STRDH770 has robust build quality and looks quite durable. It is advised to check the user guide on technical specification before using it. 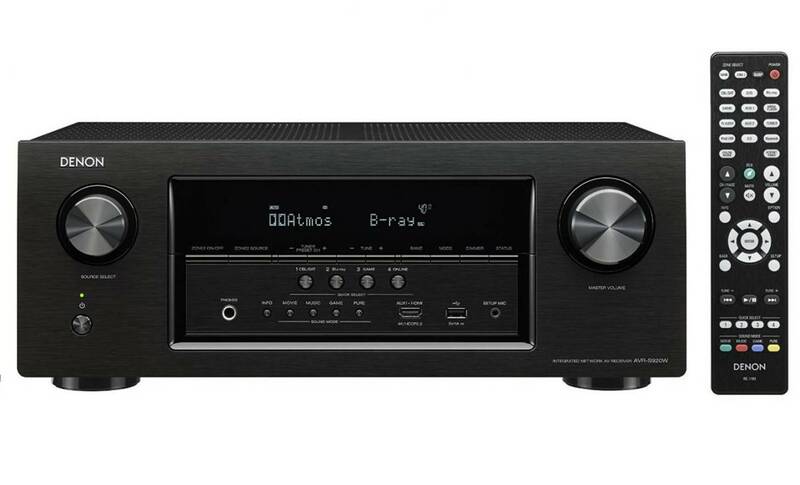 The Denon AVR-S510BT is a 5.2 channel full 4K ultra HD AV receiver with Bluetooth connectivity. It supports Dolby TrueHD and DTS-HD Master Audio, delivering high quality sound performance. All 5 power amplifier stages feature true Class AB amplification, and are configured with discrete high current power transistors that can drive lower impedance 6 ohm speakers, and each channel is rated at a maximum of 140 watts of power. The AVR-S510BT AV receiver also features dual subwoofer outputs, which lets you place 2 subwoofers in different locations. It features Bluetooth streaming, supporting Bluetooth-equipped devices that support the A2DP (Advanced Audio Distribution Profile). In addition to analog and digital A/V connectors, it features a USB port on the front panel that is compatible with portable USB devices, and can play back a wide range of audio file types. Equipped with 5 HDMI inputs, the AVR-S510BT features support for 4K Ultra HD full frame rate 60 Hz pass-through on 3 inputs along with 4:4:4 Pure Color sub-sampling pass-through, as well as 3D compatibility on all HDMI inputs. It is also equipped with HDCP 2.2 signal handling, a requirement for 4K Ultra HD copy-protected content. It features a clean front panel design and comes equipped with 4 Quick Select function buttons that let you choose from your most popular input sources, a feature that is also included in the remote. The AV receiver comes with color coded loudspeaker terminals and speaker labels which help ensure correct speaker cable ook-ups while setting up. The Denon AVR-S510BT is also compatible with HEOS Link for easy remote control via the HEOS app. 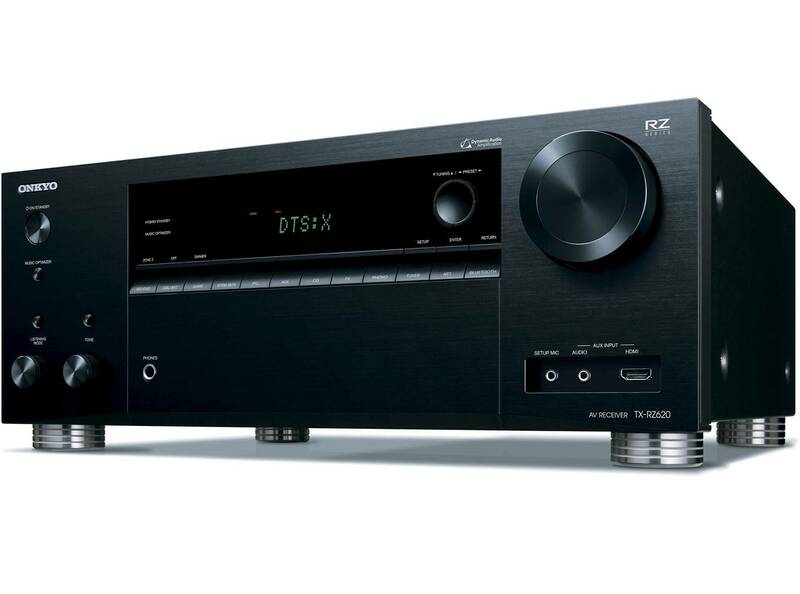 The Onkyo TX-RZ620 is a 7.2 Channel Network A/V receiver that delivers high end audio experience. It incorporates powered zone 2 speaker outputs and zone 2 Pre-/line output with a dedicated DAC supporting network, S/PDIF, and analog audio. It is equipped with Dynamic Audio amplification, 5 hz-100 kHz frequency response, and VLSC on front channels. It features 6 rear HDMI inputs, one main output and a sub output supporting Dolby vision, HDR10, and 4K/60p pass-through as well as HDCP 2.2 (the front HDMI input Supports 4K/60 video at 4: 2: 0). 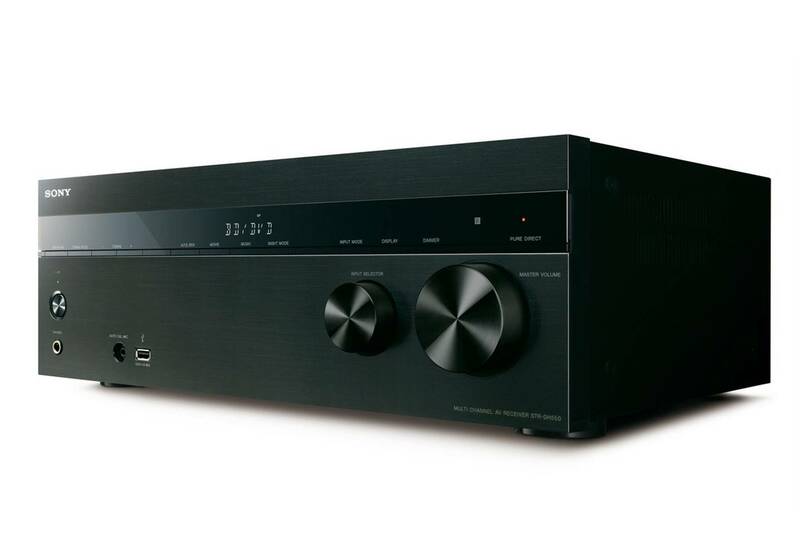 The Onkyo AV receiver is built from high quality components, such as large custom capacitors, to provide high instantaneous current for fast transients and ultra-wideband frequency response down to 5 Hz. Discrete non-phase-shift amp circuits clearly focus the audio image and cut distortion even at high volumes. It is able to reproduce 5.2.2-channel Dolby Atmos or DTS:X formats, with AccuReflex correcting the phase of direct and indirect sounds for cohesive audio imaging with Dolby Atmos-enabled speakers. This AV receiver supports multi-room audio, featuring FireConnect that mirrors network audio and external analog sources connected to a master component, from streaming services to vinyl records on FireConnect-compatible speakers in other rooms. Music selection, speaker grouping, and playback management across the home are built into Onkyo Controller app for iOS and Android. You can also stream music and control the playback with Chromecast enabled apps from your iPhone, iPad, Android phone or tablet, Mac or Windows laptop, or Chromebook (available via a firmware update). 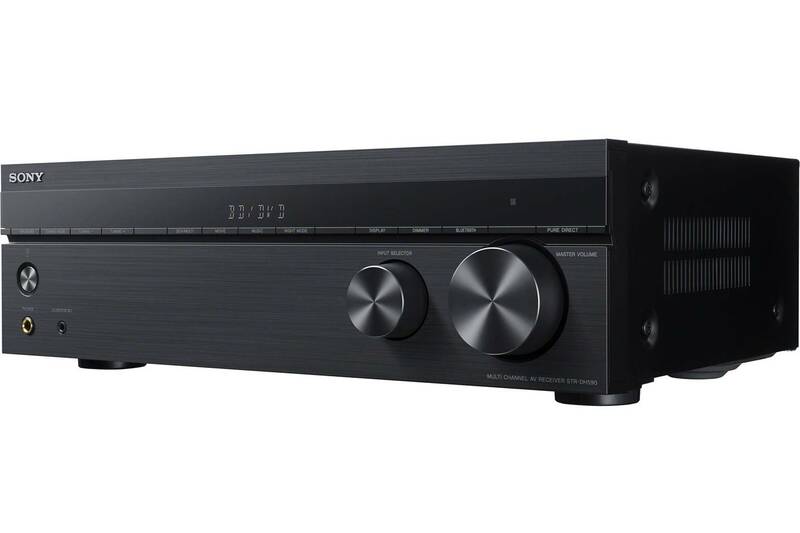 The Sony STR-DH790 is a 7.2-channel AV receiver that supports three-dimensional sound as well as high definition picture quality. It has a power of 145 Watts per channel, 6 ohms of impedance, and a THD of 0.9% per channel at 1kHz. These features allow it to deliver crystal clear and loud sound performance. It supports both Dolby Atmos and DTS:X object-based surround sound that allow you to enjoy a cinematic experience. The Sony STR-DH790 is equipped with S-FORCE PRO front surround sound and delivers enhanced detail with a wide sound stage. In terms of picture quality, it is compatible with 4K, HDR as well as Dolby Vision while it also supports HDCP 2.2. The Sony STR-DH790 features 4 HDMI inputs and one output along with an Enhanced Audio Return Channel (eARC). Besides the HDMI ports, it also comes with built-in Bluetooth connectivity that lets you wirelessly stream from other Bluetooth devices. It is easy to set up the AV receiver and adapt it to your own space using its Advanced Auto Calibration technology (Adv. DCAC) which automates the settings for the best result. The package includes additionally a remote control, AAA batteries for the remote control, an FM wire antenna (aerial), a start-up guide and a booklet with operating instructions. 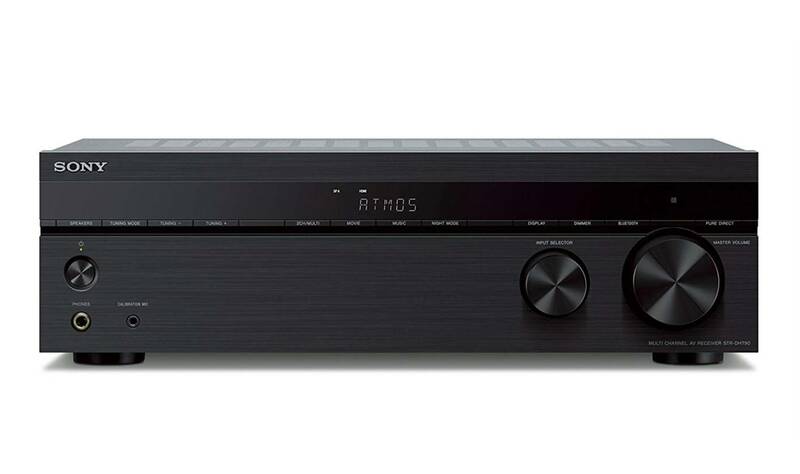 The Sony STRDH550 is a 5.2 Channel 4K AV receiver with a power of 725 Watts. It is equipped with proprietary High-Definition measurement and DSP sound technology as well as Front Height mode that enables vocal height and 3D effects for improved effects positioning and added depth. As a result, it delivers high end audio quality with a wide and detailed sound stage. In terms of ports, this AV receiver has 4 HDMI inputs and one output, 2 composite video inputs, a composite monitor output, two optical audio inputs, a coaxial audio input and 4 analog audio inputs. Its versatile HD connectivity with four HDMI inputs allows you to connect any HDMI-capable devices while the HDMI pass-through functionality allows all connected HDMI devices, including native 4K video content, Blu-ray and Blu-ray 3D movies, video games and other content to conveniently pass-through to your compatible television or projector. You can connect a smartphone via MHL (Mobile High-Definition Link) and a front-mounted USB input allows for easy connectivity and charging of compatible devices. It is easy to optimize the home theater settings for your space by using Digital Cinema Auto Calibration: you need to connect your gear, plug-in the supplied calibration microphone, and use the simplified remote to follow the on-screen prompts. 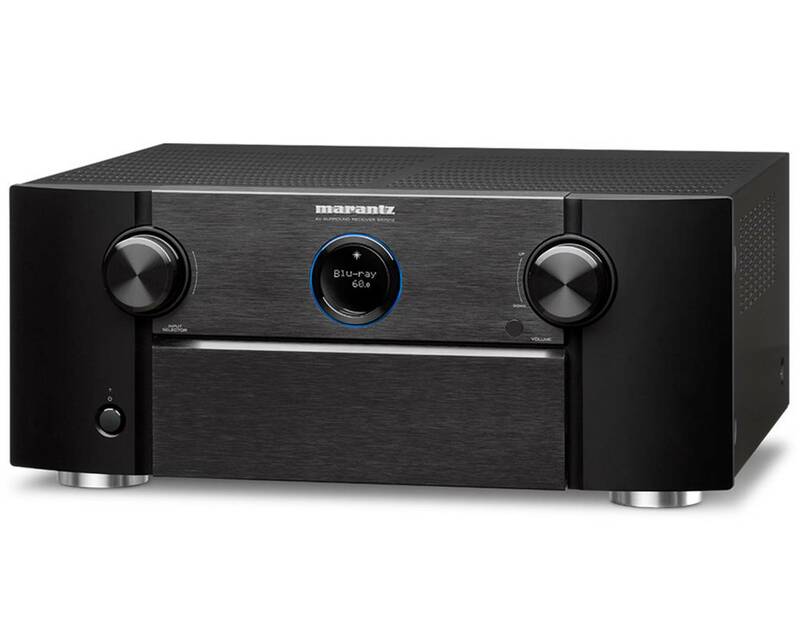 The Marantz SR7012 is a 9.2 channel full 4K ultra HD network AV surround receiver with HEOS wireless multi-room technology. It is rated at 200 watts per channel with low-impedance drive capability for speaker control, and it is compatible with 4 ohm speakers. To enjoy immersive 3D sound, you can set up a 7.1.2 or 5.1.4 3D experience without the need of external amplifier, or expand to 7.1.4 with an additional two-channel amp, using the SR7012’s 11.2 channel processing. The SR7012 AV receiver supports Dolby Atmos, letting you connect additional overhead speakers for an enhanced cinematic experience. DTS:X immersive audio places sound where it would occur naturally in space, creating a lifelike, multi-dimensional sound stage. In addition to that, it supports Auro 3D Audio that lets you enjoy three-dimensional sound for music, games and films. The Eco mode provides energy saving allowing the receiver to be used in power-saving mode. Along with 8 HDMI inputs, including one on the front panel, the SR7012 has an advanced video section supporting the latest HDMI specification, including 4K Ultra HD 60Hz video, 4:4:4 Pure Color sub-sampling, High Dynamic Range (HDR) and 21:9 video, 3D, and BT.2020. Dolby Vision pass-through support is available on every input, with pass-through for HLG (Hybrid Log Gamma) to be supported via a future firmware update. 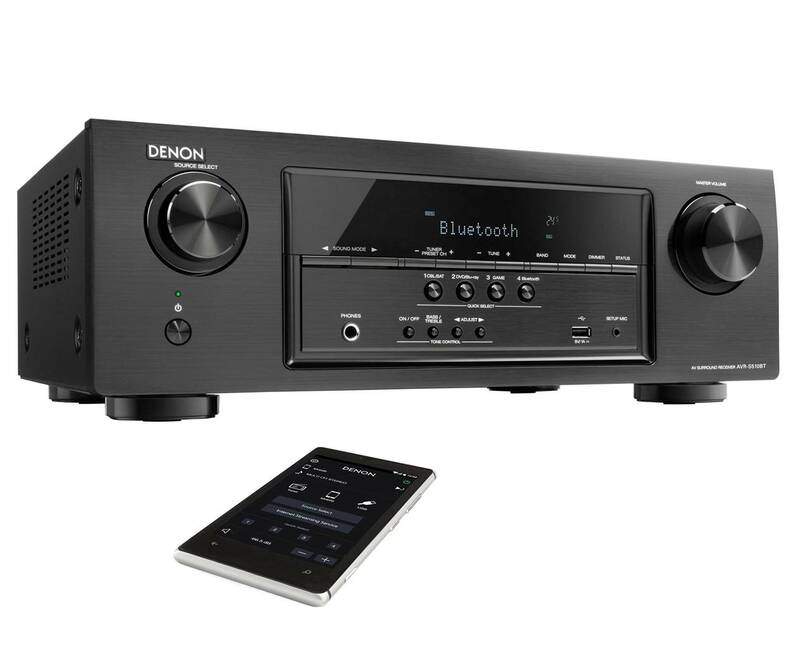 The Denon AVR-S920W is a 7.2 channel full 4K ultra HD AV receiver with Bluetooth and WiFi connectivity. It incorporates 3D and 4K Ultra HD/60Hz full rate pass-through with HDR, BT.2020 and 4:4:4 Pure Color support. It has 8 HDMI inputs (including 1 front) and 2 outputs (Main/Sub) with full HCDP 2.2 support. 4K Up-scaling It features the latest immersive surround sound decoding, including Dolby Atmos and DTS:X, now available on Blu-ray and Ultra HD Blu-ray. You can connect a 5.1/5.2 surround speaker system and a pair of overhead or Dolby Atmos elevation speakers. The advanced audio system features a powerful 32-bit quad-core DSP processor along with precision 24-bit/192-kHz D/A conversion on all channels for wide dynamic range, minimal distortion and extended frequency response. It lets you listen to your favorite high resolution audio tracks and is compatible with AIFF, ALAC, FLAC and WAV lossless file types at up to 24-bit/192-kHz resolution. You can also enjoy listening to high resolution 2.8/5.6-MHz DSD tracks. There’s also compatibility with other audio file types including MP3. For optimum matching of the speaker system and the room, the AVR-S920W features Audyssey MultEQ automatic room acoustic measurement and correction along with Audyssey Dynamic Volume and Dynamic EQ. You can control it via the free Denon application. Additionally, you can enable HEOS Wireless Multi-Room Control with the HEOS Link. The Pioneer VSX-532 is a surround sound A/V receiver with built-in Bluetooth wireless technology for easy audio streaming from compatible devices. Additionally, it features A2DP profile, with support for SBC and AAC codecs. It supports Dolby TrueHD and DTS-HD Master Audio surround soundtracks with lossless codecs for high quality. The Pioneer VSX-532 AV receiver supports Advanced Sound Retriever technology which restores the output of compressed audio such as WMA, AAC, and MP3, to the level of CD sound. The technology creates new signals to restore the minor details left out during the compression process. The VSX-532 comes with MCACC (Multi-Channel Acoustic Calibration System) auto room tuning which allows the system to automatically compensate for differences in speaker size, level and distance, and equalize response using the custom microphone. The 4K/60p Pass-through feature lets you take advantage of the highest-quality video source, by passing through 4K/60p /4:4:4 signals for viewing on a compatible display. The VSX-532 supports HDCP 2.2, so by connecting to a compatible device, you can enjoy premium content such as 4K videos with digital copy protection. It also includes HDR 10 (high dynamic range) signal pass-through support, which a technology that drastically expands the brightness peak, providing a higher contrast between light and dark images and creating more realistic pictures.